I opted for the rotisserie chicken, as it is still prominently featured on their menu. I thought it was really delicious, well-seasoned and moist. The maduros were excellent as well. Crispy edges and delightful sweet flavor. The real highlight, though, was the chicha morada, the purple corn drink that Norca at Cafe Salamera (moment of silence) introduced many of us to. D'Candela's version was more aggressively spiced (with cinnamon, I believe) than Salamera's and it was garnished with small bits of fruit. Really outstanding. The menu also features items that reflect the famous Peruvian culinary diversity: Peruvian-style fried rice (Chaufa), chicken in walnut sauce, several spaghetti dishes (tallarin), Peruvian-style tamales, Anticuchos (beef heart skewers), and ceviche. The cook, Miguel, came out and chatted with me a bit. He said he was from Mexico and that the owner was Peruvian. Miguel was real friendly with me and seemed eager to please. I will definitely return to D'Candela to try more of their Peruvian offerings. My nephew and I ate at D'Candela last week, on an impulse, and had a very decent meal. 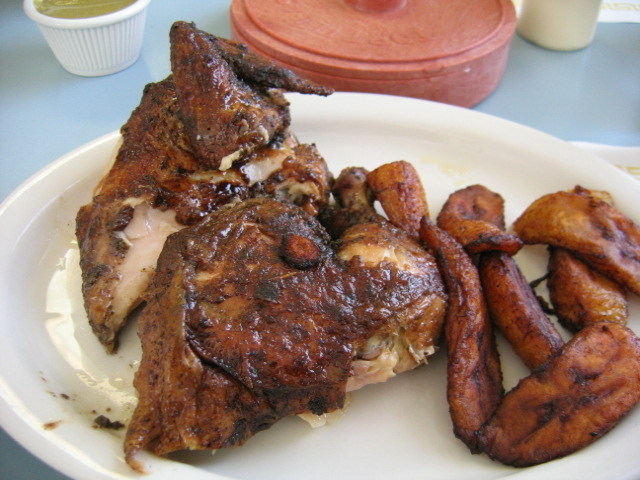 Like tapler, we had the chicken with sides of maduros and papas fritas. The chicken was excellent. It was not really crispy, having been pre-roasted and re-heated, as tapler noted, but the flavor was delicious. It was juicy with a distinctive spicing and charcoal notes. The fries were pronounced fantastic by my teenaged nephew, a noted authority on the subject. We also enjoyed the cups of soup that were served with the meal. Like tapler, I had the Chicha Morada, which was more tart than Norca's version. While we were there, we noticed some fine looking Lomo Saltado and Papas a la Hauncaina coming out of the kitchen. All in all, a very nice and very friendly family run store-front establishment. I will definitely stop there again when I am in the area. Here is a review LAZ wrote for the Daily Herald. The green salsa was pretty darn tasty also. I love that stuff. tapler wrote: Anticuchos [/i](beef heart skewers), and ceviche. Since I have an entire beef heart in my freezer, courtesy of the other 3 recipients of Bossy's generosity, I'm going to have to make a visit...strictly for research purposes, you know. Sounds delicious! Nice to see this thread revived. I have not been back to D'Candela since then, but I think it's time... Meanwhile, I've fixed the pictures in the original post. I need serious scolding for failing to get to D'Candela until yesterday, as I live a mere 3 blocks a way. I love the place. The rotisserie chicken, while it lacks a crispy skin, is incredibly juicy and loaded with garlic and oregano. No shyness in the seasoning here. The maduros were, quite simple, the best I've ever had. Crispy-edged exterior surrounding soft, sweet, hot interior. If anyone doubts whether food can be a sensual experience, have them try these plantains! At 1PM on Thursday, the place was about half full, and the crowd was made up almost entirely of Peruvians who seemed to know each other and the owner. It was an extremely jovial group. There are a number of menu items I'm looking forward to trying: arroz con pollo, shrimp fried rice, Peruvian tamales, and more. But you can be sure I'm getting a side of maduros with each and every one of them. Note to self, when going for lunch at D'Candela remember to differentiate between Kedzie and Kimball. Awning changed, juicy flavorful bird, tostones deliciously crisp foil for the mildly spicy Peruvian green table sauce and salad with cucumber and beets. Man I love beets! D'Candela uses charcoal, a solid plus in my book, and even though we did not share a common language service was efficient and very friendly. My quarter chicken lunch with gratis chicken rice soup and choice of two sides was a reasonable $6.25, half and whole chickens, also with two sides, are $8.25 and $13 respectively. Stand alone whole chicken is $9.25. as I discovered sadly this week, they are closed on Mondays. I've kicked myself several times for not having thought to call ahead. oh well, now I just have to schedule another adventure up to the city . despite missing out on this feeding, we still had a nice adventure to the Field museum and Ikea. Had lunch there Saturday. Like to add that the yucca was also very good. The pale green sauce-has that been mentioned? What is in it? By the end of the meal I was putting it on everything, the yucca, the chicken, the frijoles-I loved it! and the maduros. Do not miss the maduros. About a year ago, I had lunch here with MikeG. We enjoyed the chicken, but I left the meal more seduced by the fried calamari I saw someone else order. Sunday, we celebrated a daughter's birthday. She had one singular request: Colombian roast chicken. Could she suffer Peruvian roast chicken if it also came with fried calamari? She could! And it's true. Every bit as good as the chicken is the jalea, a dish of fried calamari, a few shrimps and some fish chunks, Wiv-crisp all under a shield of marinated red onions; with the two house sauces it kept our hunger at bay while we waited a long, long time for the chicken--boy was D'Candela a madhouse on Sunday. Chicken and calamari make for a very happy birthday. Status update: all systems normal. Chicken, anticuchos, maduros, yucca--all good. Anyone know what they put on their rice--coconut oil?--that makes it so tasty? For the first time, I placed an order at D' Candela that did not include the terrific rotisserie chicken. The place was nearly packed, and after we ordered on Saturday night, chicken after gorgeous chicken whizzed by our table, and the intoxicating smell of chicken fat dripping over live coals filled the dining room. I had serious order envy. The envy dissipated when my papa relleno and side of maduros arrived. The potato had a light egg batter surrounding mashed potatoes that had been reformed into a potato-shaped oval and stuffed with chopped beef, olives, raisins and hard boiled egg. I'm a sucker for that flavor combo, and this big, filling "appetizer" did not disappoint. The tangy, thinly sliced lime-marinated onions on the side cut through the richness nicely. The maduros, with their crisped edges, silky interior, and sweet/ sour flavors were a study in delicious balance through contrast. I'm awfully glad to have D' Candela a short, 3-block walk from home. tapler wrote: Did you try the chicha? Which, as best as I can recall, translates as something like, "not only not the good stuff, but not even the good not-the-good-stuff." I know what the phrase means, but I definitely need someone to translate that translation. You lost me, Kennyz. I'm only saying how I understood it as it was explained to me. What do you understand it to mean? Katie wrote: You lost me, Kennyz. I'm only saying how I understood it as it was explained to me. What do you understand it to mean? I've read "not only not the good stuff, but not even the good not-the-good-stuff" several times, and can't figure out what you mean by it. I do think I know what "ni chichi ni limonada" means though. Literally, "neither chicha nor lemonade," which figuratively is used to describe something that doesn't really belong to any clearcut category. Something not easily placed or described. Ah, I see what you mean. Another version I'd offer for my translation would be something like, neither an alcoholic drink that adults would enjoy, nor a nonalcoholic drink that kids would enjoy. So, the sense there (again, only as I heard it spoken and explained where I was) is less a thing not easily categorized than a thing that fails to qualify as either a real A or a real B. But then, I suppose that short pithy expressions such as this are open to multiple uses and interpretations. The MOP - Ministry of Obras Públicas - Ministry of Public Works - used to post signs near highway construction projects that said "Cuando Chile crece, todos crecemos" - that is, "when Chile grows, we all grow." The more popular version of the slogan, however, was, "cuando Chile crece, Peru y Bolivia se achican" - "When Chile grows, Peru and Bolivia get smaller." Kennyz wrote: Literally, "neither chicha nor lemonade," which figuratively is used to describe something that doesn't really belong to any clearcut category. Something not easily placed or described. The English food-related phrase that immediately came to mind was "Neither fish nor fowl," ie, something not easily categorized or not fitting neatly into any established group. According to Wiktionary, the Czech expression for same is "ani ryba ani rak" (neither fish nor crayfish). Can anyone compare their chicken to Rosa de Lima on Western? Rosa varies from great and dripping with fatty juices to just good and not so drippy. trotsky wrote: Can anyone compare their chicken to Rosa de Lima on Western? Rosa varies from great and dripping with fatty juices to just good and not so drippy. good chicken and friendly people at both places. Roughly equally good. I'd go to whichever's more convenient. I've eaten once at each place and thought them equally good as well. I think Rosa de Lima has a more extensive menu, though. D'Candela has been nominated as a Great Neighborhood Restaurant. Please discuss this nomination in this thread. The discussion period closes on March 7. Most definitely. Great chix and love the fried seafood. Excellent value as well. GNR on. Having lived in Albany Park for about 18 months now - even with places like Salam, Dawali, Nhu Lan, Great Seas, etc. - D'Candela has stood out as my favorite and most consistent option. I heartily second this nomination. Anyone know if they're open for lunch on Sundays? I'll be in the area and am thinking about stopping in. jesteinf wrote: Anyone know if they're open for lunch on Sundays? I'll be in the area and am thinking about stopping in. lunch and dinner everyday except Monday. Closed Monday. 100% agree. this is the best charcoal roasted chicken i've ever had. everything from the delicious chicken to the maduros is excellent. heck, even their white rice is fantastic. 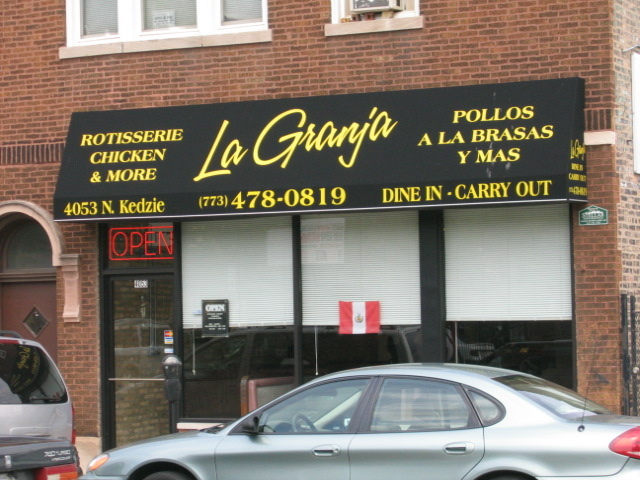 the best part about this place, besides the chicken, is the green sauce they give you. this is the best sauce i've ever had. its hot, its rich --its just plain phenomenal. the whole chicken meal with two sides can feed two people w/ leftovers, and for what you get, is a real value.